The madness of girlhood. The celebration of imperfection. The rise of the individual. John Galliano is back, and whilst his first ready-to-wear collection for Maison Margiela was filled with the deconstruction and raw-edged markings of the house, undoubtedly it was his misfit crazed characters, conjured up from his innate love of theatrics, that left the biggest impression. They played dress-up in inside-out tailoring lovingly remade, with girlish insouciance made surreal by oversized strappy shoes. Dissecting the collection for its credentials as a Margiela collection seems futile when what we really saw was the re-ascension of a talent that has been sorely missed. At the end of the show, Galliano failed to emerge, and there were collective calls from the pit and the audience for “John” to come out. He had already left the building. There was definitely method in this madness. We collectively applauded but immediately after the show, journalists discussed whether the collection was more weighted aesthetically towards Galliano or Margiela, which led to ponderings of “What is Margiela?” Are there hard and fast definitions given that Martin Margiela produced such a broad spectrum of work over the years? To give this Maison house codes seems like an antithesis to what Margiela set out to do. And with Galliano’s introduction, can we allow the house to breathe and evolve into something else. Here as Galliano aligned himself with the house, there was a compromise to be made and he did so through a thorough deconstruction exercise, revive and remake tactics and embedded details that need to be seen up close. A new Margiela is in the making and so its evolution continues, just as the founder would have wanted. Designers have been talking up eclecticism and an anything-goes approach. Who better to articulate this feeling than the king champion of the oddball. Over the years at Dior, Galliano imagined a cast of wild characters. 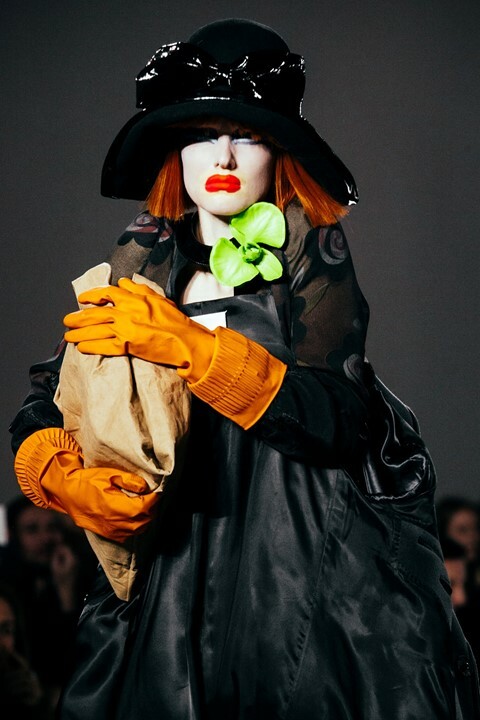 Here highlighted by the neon layerings of Pat McGrath’s genius make-up, his girl was hunched and walked like a neighbourhood loony with jackets flailing at the back as the double lives of garments were accentuated. She clutched at her brown paper bag in classic bag lady attire en noir. She slumped and slouched like a sullen teen in floral-strewn velvet. Galliano was articulating those adolescent feelings of growing up and not quite fitting into your surroundings with girliness rendered in Polaroid-inspired sepia tones. In the press notes, it said that “innocence is celebrated” but more than that, this was a collection for the misfits and mavericks out there – perhaps an allusion to Galliano himself. Imperfections are also celebrated and again, there’s no better designer to bring forth beauty from unexpected places.